Cyndie has always been incredibly generous about allowing me to post photos she has taken. Lest there ever be doubt, I add her name to the bottom right corner of images of hers that I use. On my way home from work yesterday, I received a series of images texted from Cyndie that reflect scenes she had captured during the day. 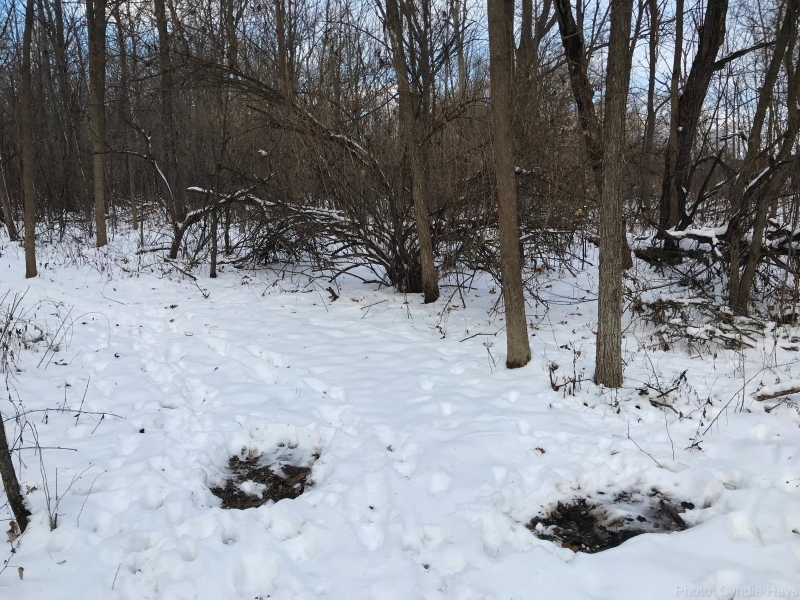 First off, this fascinating shot reveals that a couple of deer decided to lay down in the middle of a trail, for a long enough time that they melted the snow all the way down to the ground. That’s a first. With all the excellent cover available, these two chose a large clearing for their naps. Must be feeling plenty safe on our property. Notice what a difference a few days makes with regard to the snow sticking to the trees. Scroll down a couple of posts and compare this shot with the two I posted a couple of days ago. There is still plenty of snow out in the fields. 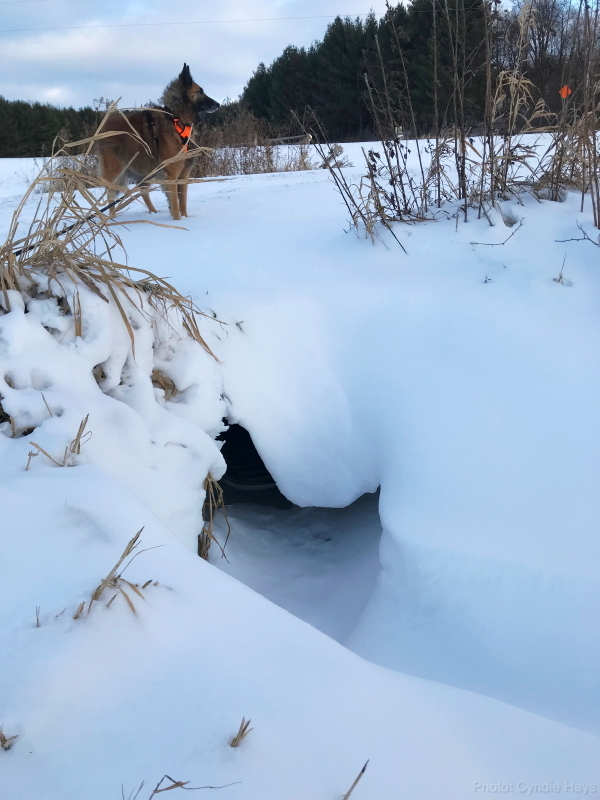 Cyndie framed up this gorgeous view of snow drifting around a culvert. Delilah looks so stoic as an accent to the shadow and shapes below her. I love the perspective of different elevation this provides. Finally, there is this beautiful sunset. 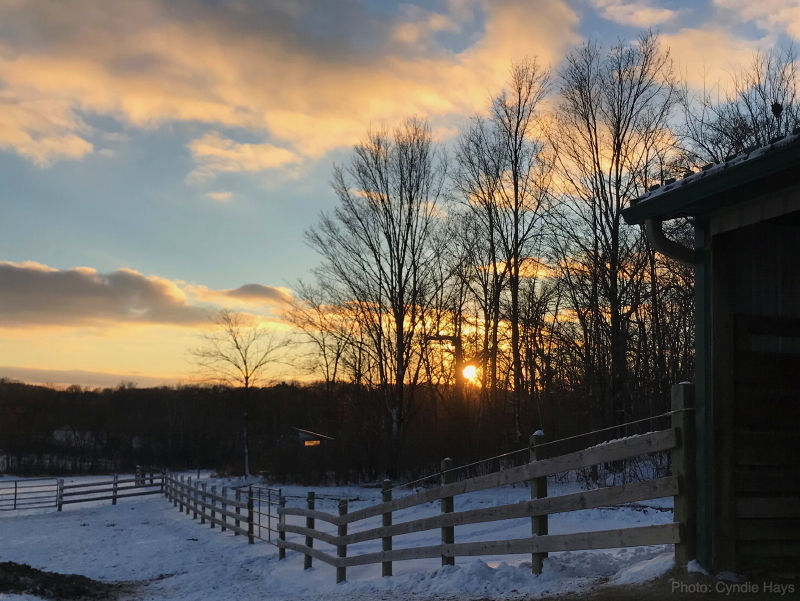 If you can make out the chicken coop in the distance, the low sun is shining through it such that it looks like a light is on in there. It’s fair to say that Cyndie has probably contributed more pictures to this blog in the last year than I have. For that, I am extremely grateful. Thank you, C!